According to this theory of mine . . . the blessed ford was not . . . the last ford on the road to Ystrad Fflur, . . . but I venture to suggest that . . . Rhydfendigaid . . . received its name when pilgrims were travelling to the old abbey situated about a mile to the south of the village . . . It might be that Rhydfendigaid was the blessed ford because it was the last on the road to the old Abbey, and possibly because there were stepping-stones across the Teifi at that last spot. While the evidence for the existence of a pre-Cistercian abbey on the banks of the Fflur is slight and tenuous, it is, nevertheless, worth considering. Stephen Williams concluded, on the basis of what he had seen and told, that this spot must have been, at one time, the site of a significant religious house, although it could not be compared in size or splendour with its successor, built some two miles away near the Teifi and Glasffrwd. There is no solid proof linking Rhys ap Tewdwr with an 'old' abbey named Ystrad Fflur. On the other hand, there are a few written references which may be construed as confirmatory, and they are listed below. John Leland , following his visit to Ystrad Fflur (around 1536), named Rhys ap Tewdwr as the original founder of the abbey. It is widely believed that he confused Rhys ap Tewdwr with his grandson, Rhys ap Gruffydd. However, it is just as likely, that he wrote precisely what he had been told by the resident monks, and/or what he had read in the abbey records, to which he had access. Rhys ap Tewdwr died in 1093, so this reference would have to be to a monastery (also called Ystrad Fflur), founded near the Fflur, before 1093. Lewis Glyn Cothi wrote sometime in the mid fourteen hundreds ‘Tewdwr a wnaeth tai wendy o flwr y vro wrth Flur vry’ . Again, this could be interpreted as another reference linking Rhys ap Tewdwr to an old abbey close to the Fflur. The author gives no authority for his claim. However, it is known that both Bleddin ap Maenarch and Rhys ap Tewdwr died in battle against the Normans in 1093. There is no obvious reason to doubt Theophilus Jones, and it is possible that the two were buried in the same monastery which, of course, would, again, have to be the 'old' abbey near the Fflur. William Camden, writing within about fifty years of the dissolution of the monasteries (1536-1539), refers to an old abbey on the banks of the Fflur as a Priory of the Cluniacs within the commote of Penardd.
. . . in a ruinous condition owing to the long-continued wars in which the country had been engaged . . . since his death, and that . . . the Cluniac monastery as it was called by Camden, became merged in the new foundation for the Cistercian order . It is not an unreasonable argument. When Robert fitz Stephen (then lord of Penardd) offered Whitland abbey a modest endowment to found a daughter house in the commote of Penardd, it would have been expedient for him to prevail upon the beneficiaries to take over an ailing monastery within the commote. The later would have a ready water supply and, presumably, stone buildings, at least, suitable as temporary accommodation. Certainly, it was not unknown at the time for some extant monasteries to become established Cistercian houses. While the above testaments may only be faintly conceded, there is additional, perhaps more persuasive, evidence to support S M Powell’s claims. There are local place-names and landmarks that point to an ancient north-south route through the village, leading directly to the old abbey site. The latter crosses the Teifi a short distance below the present bridge [Figure 1]. Whether this crossing is the original ‘holy ford’ is considered next. 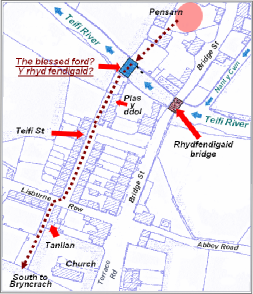 What’s more, prior to the present bridge being built and the road re-directed in 1760 , the main route through Rhydfendigaid was along one of the oldest village streets, called Teifi Street. There are clear telltale signs, even today, of a pathway running from the river to Teifi Street and beyond. It starts near shallow waters close to Pensarn, roughly fifty yards below the bridge ; it goes on for about sixty yards, past an old, long-standing house called Plas-y-ddol, to join the lower end of Teifi Street. On reaching the top end of the street, it crosses Lisburne Row and then on to, what is to-day, a short cul-de-sac (about twenty-five yards long), ending opposite a private-property called Tanllan. Doubtless, it would have continued (before the road was re-routed) in a straight line, beyond the cul-de-sac, towards Bryncrach. From there, it would, probably, have followed the same route as the present B4343 which runs in the direction of the Old Abbey farm. Again, roughly half-mile or so beyond Bryncrach and a short distance to the north of the Old Abbey farm there is a field called Cae Porth Llwyd. In the early eighteen hundreds, it was also the site of a cottage called Porth Llwyd, where a certain Richard Evans and his wife brought up five children. 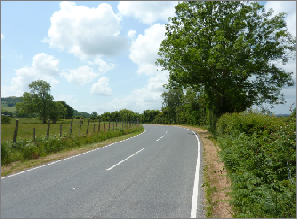 What’s more, a sharp bend in the B4343 road, adjacent to Cae Porth Llwyd, is still referred to, locally, as Tro Porth Llwyd. The name Porth, together with its Latin origin, suggests that this spot may have been, at sometime, a prominent gateway to an old religious foundation . Figure 1 shows what was, undoubtedly, the main north-south track through the village before the present bridge was built in1760. Again, it is tempting to suggest that this was the route taken by ancient pilgrims to the old abbey before the arrival of the Cistercians. Stephen W Williams, The Cistercian Abbey of Strata Florida, London,1889, p 20. The Itinerary in Wales of John Leland in or about 1536-1539 from his manuscripts, Edited by Lucy Toulmin Smith, London 1906. Gwaith Lewis Glyn Cothi, published by the Society of Cymmrodorion, Oxford, 1837, p 266. Theophilus Jones, A History of the County of Brecknock, London, 1805, Volume 1, p 270. T Williams, How old is Pont Rhydfendigaid?, Ceredigion, XV (2), p1. Interestingly, there is also a sharp road turning called Tro Pen Porth near Ystrad Fflur. For more information about Ystrad Fflur, see Strata Florida Project, The University of Wales, Trinity Saint David. There is some evidence to suggest that the course of Teifi may have been diverted when the first stone bridge was built and it is possible that the ‘holy ford’ was located just slightly to the south of that shown in figure 1. One hundred years or so ago, Pensarn was a very familiar local name in Rhydfendigaid. It was the name given to a strip of land and some old dwellings (now long demolished) close to where the river Teifi flows through the village [Figure 1]. Sarn is a well known name, meaning stepping stones for crossing shallow water (or wet marshy ground), and it is tempting to conclude that Pensarn would have been near to the initial 'holy ford'. Who blessed the ford and gave the village its name? Pwy a pha bryd y bendithiwyd y rhyd fendigaid?